A demon ark sent by Witch King Morda is nearing the Aventurian coast. It carries a Dark Diamond - a breeding ground for demons and undead. You must stop the Ship of Lost Souls, before it makes landfall and spews out the terrible creatures in its belly. 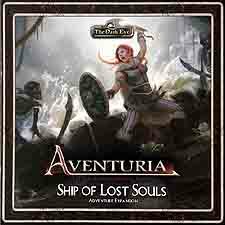 Ship of Lost Souls is an expansion for the Aventuria Card Game.This box contains the adventure Ship of Lost Souls in three acts as well as the short adventure Rietholtz's Treasure./ Additionally it introduces a new hero, Tjalva Garheltdottir, a Thorwalian warrior who uses her physical strength and battle prowess to smite her foes. 1 Hero Counter "Tjalva Garheltdottir"
1 Life Counter "Tjalva Garheltdottir"